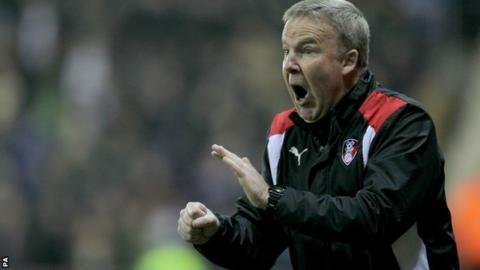 Kenny Jackett has left his job as manager of the Championship's bottom club Rotherham United after just five games and 39 days in charge. The 54-year-old offered his resignation following Saturday's 2-1 defeat by Leeds and the Millers have now terminated his three-year contract. The former Watford, Swansea, Millwall and Wolves boss only took over at the New York Stadium on 21 October. Coach Paul Warne has been put in charge of the first team as caretaker boss. "Kenny's resignation came as a shock to the club and is disappointing," said a statement on the club website. "Paul Warne has agreed to take care of first team matters on an interim basis whilst the board of directors begin the process of appointing a new first team manager." Former Wales international Jackett was appointed two days after the sacking of Alan Stubbs, who himself was only manager for 14 league and cup games. Rotherham have won once in 18 league matches this season and are eight points adrift at the foot of the Championship table. They are now looking for their sixth new manager since the start of the 2015-16 season. Steve Evans left in September 2015, and his replacement Neil Redfearn was sacked in February. Neil Warnock was brought in until the end of last season and successfully kept Rotherham in the Championship before deciding not to stay on. Stubbs, who had led Hibernian to a first Scottish Cup success in 114 years in May, signed a three-year deal with the Millers the following month but was sacked on 19 October.